Handheld pulse oximeters are a great non-evasive solution for anyone needing to measure oxygen saturation in their blood on a regular basis and helps avoid the hassle of taking frequent blood samples. A Hand Held Oximeter is easy to use, portable, and comes with a fingertip sensor that fits comfortably on the tip of your finger, relaying your results in a matter of seconds. The 300K1 handheld pulse oximeter is suitable for adults or pediatric patients and features both spot check and continuous monitoring modes. It also boasts low power consumption, a low battery indicator, and 72-hour record storage. See below for specifications on the 300K1 hand held pulse oximeter and be sure to check out the Oxi-Go digital finger pulse oximeters such as The Elite Pulse Oximeter, The Premier Pulse Oximeter, the QuickCheck Pulse Oximeter, and the QuickCheck Pro Pulse Oximeter. 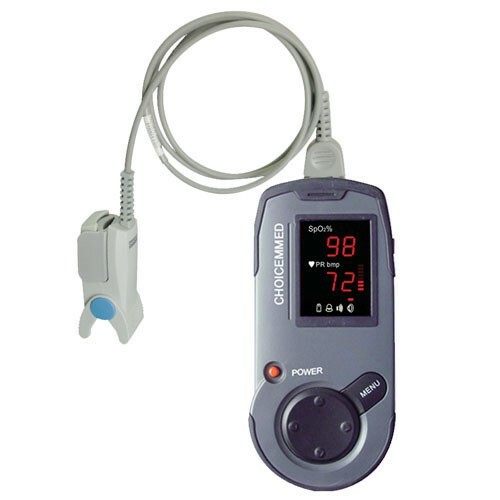 Also see our other handheld digital oximeter, the 300i Pulse Oximeter. Displays SpO2, pulse rate, and a pulse bar. Supports two AA alkaline or rechargeable batteries. Records up to 72 hours of data, how do you access this data? Is there software that displays this collective data? Can this be worn throughout the night? Accessing data collected typically takes a USB cord and can be connected to a computer for downloading and tracking. As long as there is a way to keep the oximeter on, it may be able to be worn through the night; however, it's best to contact the manufacturer for clarification on usage longevity. It doesn't say whether it has a power cord, or is battery only. Pics also don't show power port. This is a battery-only unit, according to the manufacturer.